The Geography Department maintained our annual tradition of celebrating Fairtrade Fortnight in school. We have been working to raise awareness of how supporting Fairtrade can help make the difference to ensuring farmers in developing countries get a fair deal and decent working conditions. We started Fairtrade Fortnight with 10 Year 12 Geography Ambassadors visiting Thorndown Primary School where they delivered an assembly as well as lessons to Year 5 and 6 on fairtrade. We also held a Fairtrade house competition to support our Fairtrade Stalls selling fairtrade biscuits, chocolate and jelly beans, with Wheatsheaf house showing the most support for fairtrade products over the two weeks, winning 50 house points! 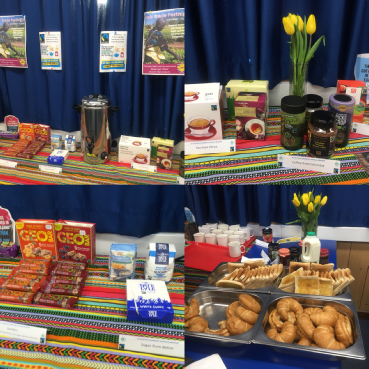 In culmination of the two weeks of events, the Geography Department hosted a fairtrade breakfast on the final Friday to raise awareness of how supporting fair-trade can help farmers escape from poverty. As well as fairtrade bananas, biscuits, jams, marmalade and honey, a range of fair-trade drinks were enjoyed by staff and students, including tea (from Kenya), Coffee (from Columbia) and Hot Chocolate (with cocoa from Ghana). Two fair-trade easter eggs were also won by in our free fairtrade raffle. Year 12 students have recently returned from a fantastic four day residential in Snowdonia investigating both physical and human processes. 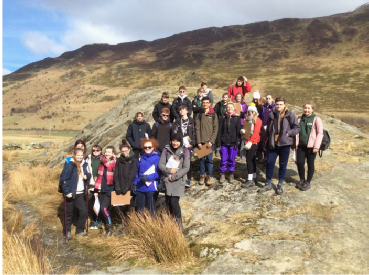 Fieldwork is an important, and indeed integral part of the A level Geography course and the Snowdon area provides the perfect opportunity for students to study geography out in the field. Students developed confidence in their fieldwork enquiry skills and fieldwork techniques in preparation for their independent enquiries. This involved coastal fieldwork undertaken at Llandudno and changing perceptions of place in the ex-mining towns of Blaenau Ffestiniog and Llanberis. Students also visited the spectacular Nant Ffrancon and Cwm Idwal to revise and consolidate their understanding of glaciation and the impact of glaciers on the landscapes. A great time was had by all and our students were a credit to both themselves and St Ivo School. With the Easter break now upon us, we are well into the revision season for both our GCSE and A Level students. Afterschool GCSE revision sessions continue after Easter and we would encourage our Year 11 students to make use of our question booklets as well as online resources such as Schoology, GCSE Pod and PiXL Geography. 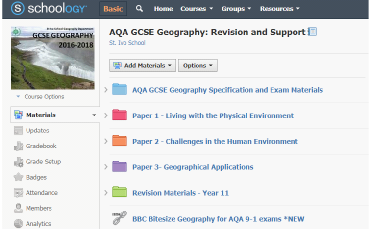 In preparation for the exam season, our Year 10, 11, 12 and 13 GCSE and A level Geography courses are now all available online as full courses on Schoology (www.schoology.com), with powerpoints, video clips, links and supporting resources. We hope this proves useful as another way for students to access resources for revision, as well as for students to ensure that all notes are up-to-date. Students can get the relevant access codes to join their courses from their teachers. The Geography Department wishes everyone a Happy Easter and an enjoyable break.